perspective and regards the finity of life from an infinite viewpoint. it senses immediately the sound of freedom emanating from deep within. Heart teacher Thomas Young walks his talk: “True trans­formation only takes place through the heart center. The moment you anchor your life deeply in the heart center, you follow the path of the Initiates”. The clairvoyant mystic introduces special techniques on how to experience the energy of the heart center. On his travels throughout the world Young who is of German origin experienced several heart initiations which completely transformed his life. Thomas Young holds a M.A. in Sociology, Psychology and English. He majored with an essay on „Humor“ and after that was offered to teach on the subject of “Humor” at University which he successfully did for one season. Instead of choosing an academic career he had already decided to found a creative company in the beginning of 1992. Thomas Young successfully led his company as Founder/CEO for 8 consecutive years and sold it in the beginning of 2000 which also marks the start of his path as a wisdom teacher. From then on he built up an ever increasing following of people from all walks of life who are interested in self-development, healing, consciousness-raising techniques and especially in exploring the heart center. Since 2005 he calls Big Island Hawaii the Home of his Heart. Thomas Young sees himself as a conduit, a high frequency catalyst of consciousness. Other than that Thomas is a grounded being, likes action movies, loves football and is delighted by a morning cup uf Kona Coffee. National Teachings since 1998 International Teachings since 2000 From the very beginning Thomas Young attracted into his workshops, seminars and speeches high-profiled people and multiplicators being themselves leaders in their own field of expertise such as doctors, healers, principals, CEOs and therapists from a variety of schools. What the mystic has to offer as a heart teacher is truly unique to those excellent participants. Thomas Young is a well-known and well-received key note speaker on many congresses. His heart work has been featured in various articles and media appearances. Just recently in the movie AWAKE by award-winning director Catharina Roland who portrayed spiritual teachers worldwide in her striking film. A good Outer Teacher guides people to their own energy. These rare species can be recognized by the progress made by their students. The mystic Brugh Joy was the last Outer Teacher I met. Our meeting in Arizona was like two old friends reuniting. Following the profound transformation and inspiration which was evoked by the encounter, an Outer Teacher no longer is in my life. The old ego, a film maker, sociologist and business man, died in a cataclysmic experience. The energetic connection to the resources of the heart center, to the Inner Teacher, was fully established. The most amazing thing is that one part of the psyche is no longer on a quest, it is nowhere. Now and here. In the heart. What remains is gratitude and a readiness to experience life anew every single moment. The transformation of consciousness is obviously easier in a group than alone and requires a teacher who sets off the sparks at the beginning and helps clear obstacles out of the way. In this process, a teacher just opens this window which truly leads to the inner spheres. Through his presence, the teacher inducts something which can only be experienced firsthand. It is the non-language of a lecture which reaches the souls of those listening and strikes a responsive chord in them. At the same time, group meditation creates a heightened field of energy which opens the way to center in your heart. 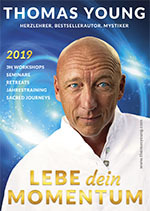 During these weekend conferences, a central technique will be taught which can be practiced at home and sets the stage for the 10-day mystery training and initiation “Sacred Heart”. The awakening of love, emanating from the heart chakra, astonishes even great skeptics. It is its energy which heals the pain of year-long wounds and lets the soul blossom full of gratitude. This love is not emotional, not sexual, not intellectual. Even when suffering the greatest of strain and profound pain, the heart is capable of experiencing joy at the same time. It is always connected with an infinite source of happiness and there is absolutely no reason for it. The moment you register for a heart conference, the energy of the gathering starts to work. Pay attention to unusual encounters or events. Write down your dreams. The deep psyche is not bound to time or space. Immediately after the decision to sign up for the conference, something wonderful starts to prepare you for the opening of your heart.